Production | Crews | Characters | Sourcing | Props & HUDs | Locations | Building Sets | Join in! 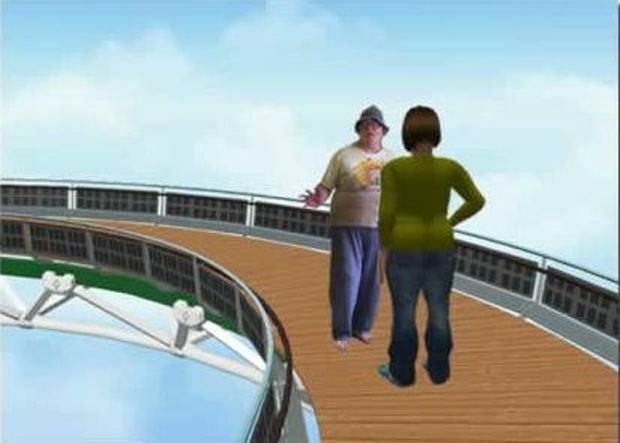 As a user of a virtual world it's more than likely that you can take a snapshot of that world. This will be either using a built in function of the virtual world client, browsers, or viewer for that world, using your own screen capture program, or your operating system's native utility. If your comic has only one main character (your avatar) and perhaps the avatars you meet in that world, then the images for your comic can be done as you like when you're logged in to that world. Other circumstances, where there's more than one main or regular character (including where all those characters are only outfit sets of your only avatar) require more organisation. In those cases you need to pose all the characters in a scene so that you can take a snapshot. Using live avatars (those belonging to other users) requires some advance messaging and agreement on when and where the avatars will turn up, what characters they are playing, and any extra requirements (e.g. specific poses) needed for the scene. Even if you are only using your own avatar and alts/NPCs, you still need to be clear about what images you need from the shoot, or you won't get what you need. Note that in the above example, the script tells us which page and panel it refers to. The description of the scene was on a previous page. The panel descriptions tell us which characters are in those panels and the actions taken. The SFX and speech are more relevant to post-production, but if a character's talking or growing, their expressions and poses should match. Now you don't have to create a script as formal as this, but you need something that will give you enough information to organise your shoots. You might like to check out How to Format a Comic Script for a more formal tutorial on comic scripts. Your avatar plays all the characters, and changes character outfits and re-poses, between snapshots. All the snapshots for a panel will be composited later in post-production. In this instance you can assign/create one NPC per character, each to be posed later, while the avatar that owns them takes snapshots. For this all the characters are player by avatars/alts. If you have enough avatars/alts in the production crew you can assign one avatar/alt to each character. Otherwise several avatars/alts with duplicate character outfits can play the same character(s) if required, while the other avatar/alts play unique characters. Like the solo act, post-production compositing might be required. Scene 7 takes place in the D'Olby Base kitchen area and features four characters: Egbert and Elizabeth Quacken (both older versions of the character), Octobriana, and Jenny Quacken (a.k.a Jenny Everywhere). Both Laurel and Dummy can play Jenny, but only Laurel can play Elizabeth, so Dummy will play Jenny in the scene. 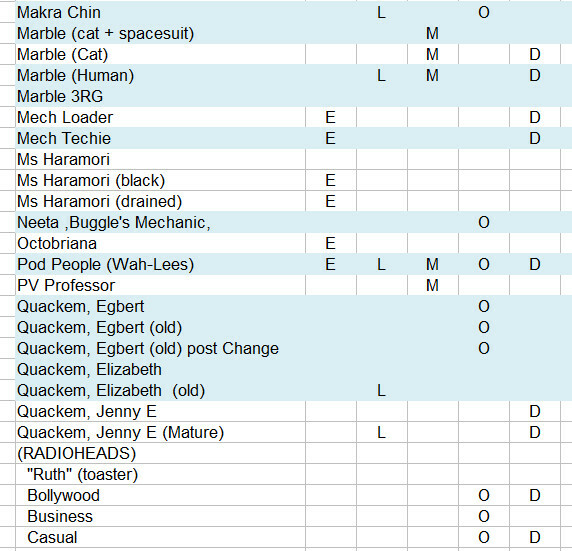 Scene 8 takes place in the Conference room, and has six characters but there are only five players.This will require two sets of snapshots, the first with four of the characters in (Marble as Trevor, Optimum as Dr Optimum, Elsie as Harimori, and Dummy as Jenny), and a second with the two remaining characters (Optimum as Egbert, and Laurel as Elizabeth), who'll be composited into the images of the first set in post-production. For each panel you need at least one or more images to choose from. Like a photographer or a film director, by having more than one version of an image for a panel, you give yourself a extra choice later when deciding on the best shot. If you only take one shot for each panel, you will forced to use it, unless you do a re-shoot. Someone has to be the director who tells others what to do, and someone has to be a camera person who takes snapshots/screenshots of each set of poses to create images for the panels of the scene. In a one person outfit that will be the same person - you! In a larger production crew that might be different people. In either case, whichever avatar is the camera person (and they may also be an actors in a scene) is responsible for consistent sets of images. For a an image to be consistent it needs to be taken from the same viewpoint, with the same client/browser/viewer. Before taking any shots it's preferable to set the environment of a region manually, otherwise the sun's position will change over time and produce different lighting effects. 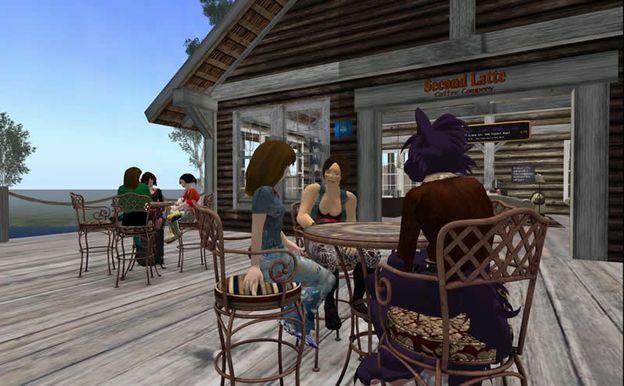 For most of the Return To Second LIfe storyline, the Seconds Crew used a commercial HUD called ClubCamera HUD Mk III Box (or the ClubCamera HUD Mk III Maxi Box). Both allowed its user to save and manage 9 or 12 viewpoints from within the current region. The avatar's viewpoint could be set to any of these, and if used later in the same region, you could go back to the same viewpoints again. This made post-production compositing much easier to do as multiple images could easily be superimposed on one another. This HUD allows the user to lock a particular view, unlock that view, or swap between the locked view and a current view. This is a very HUD, but the locked viewpoint is saved over sessions, and it can be copied and those copies locked to different viewpoints. This HUD also allows a user to lock and unlock a viewpoint, and has a number of preset positions relative to the avatar (e.g. Left Shoulder) to dynamically set the viewpoint. 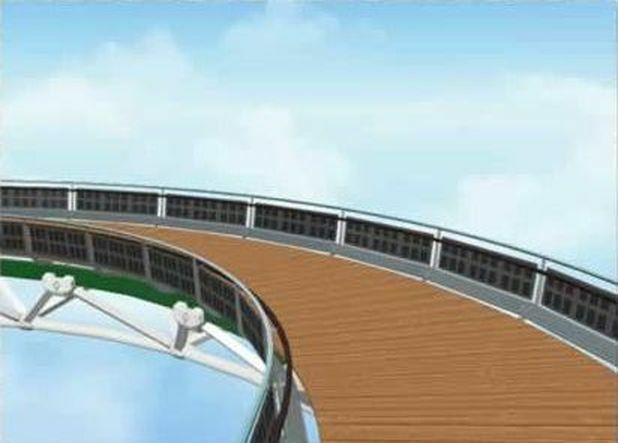 From the SL wiki: This is a camera control system which allows you to place camera objects in the world and view them by clicking on them. You can also cycle between cameras using a HUD and create a "game-style" environment where entering certain areas gives certain camera views. If you have someone in your crew who's good at scripting, they could create a custom script/HUD for your needs. 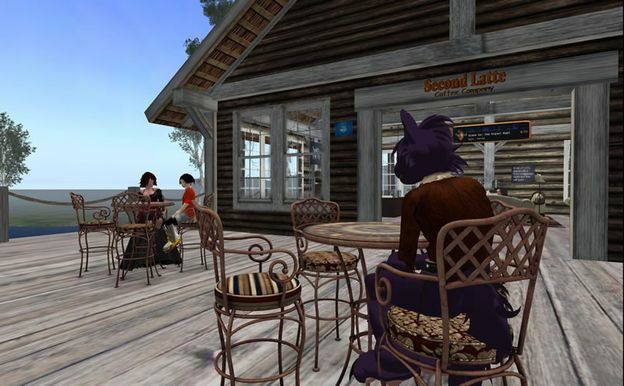 Or, there may be a commercial camera script available on your grid or elsewhere on the Hypergrid. The main thing is to have a means of storing a viewpoint for later use. If you are the only actor, then the optimum sequence is to play as one character at a time, changing poses and expressions for each panel as needed. Where another character appears in a panel, you record that viewpoint and when you've finished shooting for the first character, you change to the outfit of the next character, and pose and express accordingly. Repeat until all characters are done. This can be a long process. 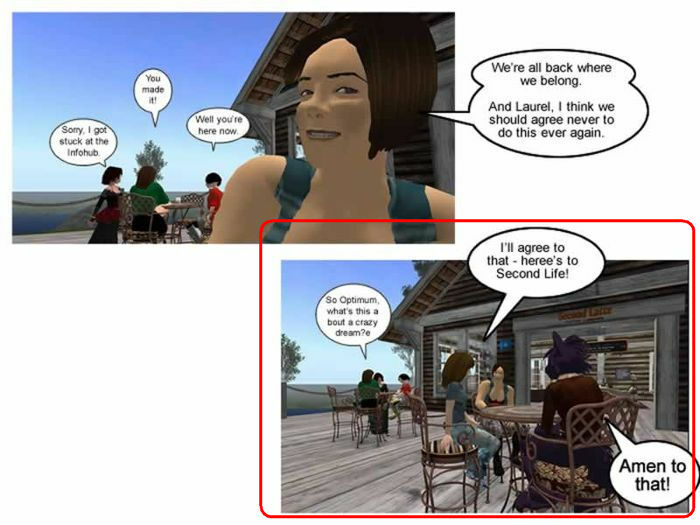 The One Day in Second Life story was shot using three avatars but with only two logged in at any time. 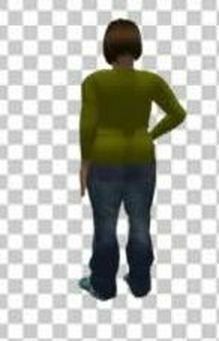 One avatar would hold a view point while the 2nd logged out and the third would log in. That was all done within 24 hours! The most likely scenario for this is using NPCs in your own region in either the Hypergrid or a Stand-alone grid. In this case, you have some work ahead of the shoot preparing each NPC to resemble a character outfit your avatar is currently wearing. Assuming that this has already been done you can then "program" an NPC to move to a location and pose as well. Control prims for NPCs should be out of view or hidden in the scene. Once each panels images are shot the NPCs can be either removed if no longer needed, or reprogrammed for the next set of poses. Repeat for each panel until done. With an acting group, a lot depends on who shows up on the day. If you're short on actors you might be able to cover these if there are duplicate outfits for that character with others in the group. Once again each actor will position and express themselves as directed (more or less). The camera person takes the shots for that panel, until done. Then the actors/characters for the next scene move to new positions to pose and express and shots are taken for that panel. Repeat until done. If you need to have actors playing more than one character, you need to save the viewpoints for the panels they appear in, then go back and shoot the extra characters for add in post-production. Once all the shooting's done, you might consider taking everyone to a a "wrap party" somewhere in world! After shooting is complete, some compositing may be necessary, to either create a image that never existed in the first place, or adding characters in images in situations where not all characters in that panel's image could be shot together. The following two examples show how this is done. Both examples were done using Adobe Fireworks (which has since been discontinued) but you could easy use Photoshop, GIMP, or any other editor that supports layers, blending and transparency. This examples shows how a panel on the S-Bend page was created. 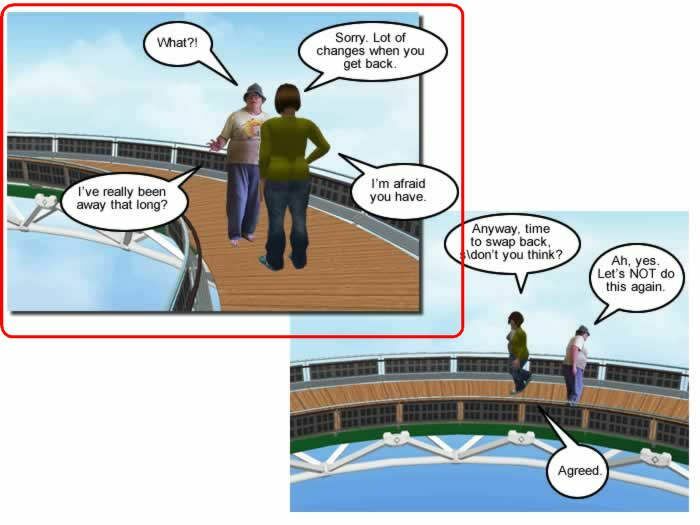 As shown below, Laura_S is meeting Elsie on a bridge between worlds. In this case he bridge was shot in the virtual world of Cloud Party. However, Cloud Party ceased operating before that scene was shot, so it was no longer possible to shoot in that world. The work around was to use the existing images and the image below was chosen for that panel. The real life Laura S (yes, she needs to lose weight) was shot with a digital camera before a plain coloured wall and then imported to the graphics editor where the background was masked out or deleted (the right hand side was deleted by accident, but that made no difference). 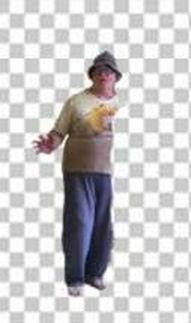 This is pasted and positioned in a layer above the previous image. The Elsie character is shot separately in-world against a plain background and like the Laura_S image, is pasted and positioned on a layer above both previous layers. The result is the image below. Further adjustments could have been made - shadows and extra highlights added, but that was skipped because of time issues. This example is taken from a panel on the No harm done page, as shown below. 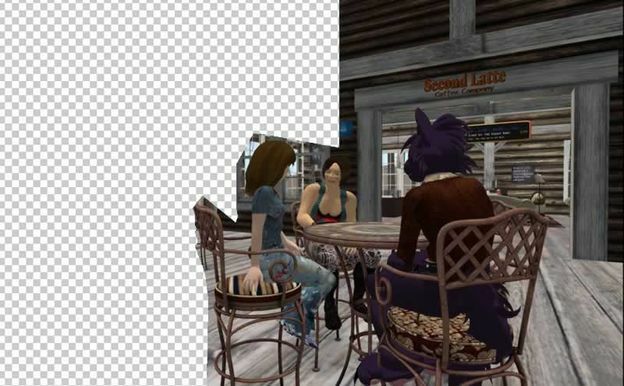 There were six characters in the shot and only five avatars available, so at least one character would have to be added after the initial shot. Marble was the camera person for this panel and his position doesn't change. The first image shot also shows a version of Optimum (played by Optimum) talking to the Jane Lane character (played by Laurel). In the next image Optimum is gone and Daria Morgendorffer (played by Elsie) is in the background. This image was pasted into a layer above the previous image. That layer's then reduced temporarily to 70% opacity and aligned with the one below it. Then a portion of the layer is deleted/masked out so that certain bits of of the layer below show through. In this case we get to see Optimum and Jane's head (which was in a sleeping position on this layer). Then the opacity is restored to 100%. The third image includes Elsie and Laurel (both played by themselves) in the foreground. We paste this into the layer above, and follow the same procedure as outlined for the previous image. In this case we can delete/mask everything to the left and above of Laurel and Elsie. The final result is shown below. You can see that there are slight differences in brightness by the line of contrast above Elsie. This could have been fixed, but in the final version there's a speech balloon that obscures that. Sometimes, no matter what you do, it all goes wrong, and you have to shoot one or more panels again. This is a good reason to save viewpoints from earlier shoots. You'll just have to go back and do it again.